The American adaptation of Ghost in the Shell has become yet another classic example of American "white-washing", or the practice of adapting material from a foreign culture as an American production featuring primarily Caucasian talents in the primary roles. It's a legitimate concern that affects the Asian American community but is a pretty big subject to get into. So it's tricky not to let the online discussion about white-washing affect one's effort to evaluate the movie based on its own merits. And given how much coverage was given to that subject before the movie's release, it's easy to fall into that mindset. So I did my best to keep a open mind while watching it and tried to focus more on the story with some comparisons to the source material. In the end I was more disappointed with the narrative changes made to the story more than the casting choices. Even a good actor or actress can't really save a confusing and unnecessarily convoluted story. Synopsis: Ghost in the Shell is a 2017 science fiction action movie directed by Rupert Sanders. The screenplay was written by Jamie Moss, William Wheeler, and Ehren Kruger as based on the manga of the same name written by Masamune Shirow. 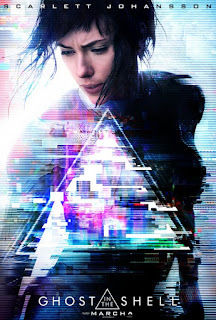 In a future where human augmentation by cybernetics is possible, we are introduced to Mira Killian (Scarlett Johansson). She's the lone survivor of a cyberterrorist attack that makes her the test subject of a new procedure that integrates a human brain into a cybernetic shell. She then gets recruited into a secret counter-terrorism unit known as Section 9. Fast forward a year and Killian is now a Major in Section 9. She routinely engages in operations with Batou (Pilou Asbæk) and they all report to Chief Daisuke Aramaki ("Beat" Takeshi Kitano). What starts as an effort to protect a business conference organized by Hanka leads to identifying a new figure known as Kuze (Michael Carmen Pitt) who appears to have a much larger agenda. And indications point to Kuze not actually being human but instead some sort of advanced AI who is able to gain control of people, thus turning them into puppets. What I Liked: The visuals of this movie, particularly related to the background setting, are amazing. It's like the anime made real or Blade Runner revitalized with new colors and life. There are a lot of crazy details that add a lot of character to the world of Ghost in the Shell itself, which is great. In this manner the movie is quite the visual masterpiece. Scarlet Johansson has the role of the skilled female fighter down pat given her many action roles in recent years and her fighting ability shines through. There are some great fight scenes in the movie that may not necessarily feel anime-authentic but at least are executed well. And there was also a bit of effort to translate a lot of the characters from the original manga into live-action counterparts. What Could Have Been Better: The biggest shift is making the augmentations for the Major and Batou as sort of against their will. Instead of the leveraging cybernetics to be better agents, there it's just a result of unfortunate circumstances and necessity. So there's an odd man-versus-machine sort of arc in this story that feels wrong or out of place. So now it feels like the society isn't accepting of augmentation and instead rebels against it, which wouldn't explain how prevalent the technology is. Then you get to the acting. While Johansson's fight scenes are pretty fun, her acting is odd. For some reason the Major's being cool, calm and collected in the original manga became deadpan and emotionless. And we had inconsistent acting from people being taken over by Kuze with moments of wooden, mechanical speech but fluid human movements and vice versa. If it's supposed to be a forced seizing of control of people, you'd think that control would be inconsistent. TL;DR: Ghost in the Shell is a weird creation that is able to pick up the visual sensibilities of the source material but loses its spirit and tone. It's a movie that ends up feeling more confusing that it needed to be and thus becomes rather sad in a number of ways. And so the movie only gets 2 unnecessary plot elements that just muddy up the overall narrative out of a possible 5.